Much of central Pittsburgh appears rather confusing for those try to travel around by car, with roads heading in many different directions and often being one-way only. Therefore, a large number of tourists visiting Pittsburgh simply use local bus transport or the 'T' subway trains, choosing only to rent a car if day trips outside of the city are planned. Run by the Port Authority of Allegheny County, the city's public transport network provides good value and a very cheap way to travel to all of the city's main neighborhoods. In you have time on your hands, then do consider traveling around downtown Pittsburgh on foot or by bicycle, particularly since there are so many appealing trails along the riverbanks. 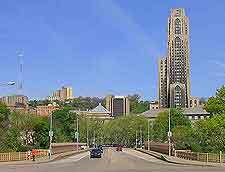 Most visitors to Pittsburgh choose to travel here via its busy international airport, which is located around 14 miles / 22 km to the northwest of the city center, in the suburb of Findlay. 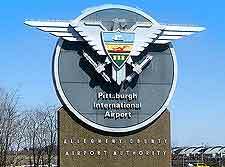 Pittsburgh Airport is currently Pennsylvania's second-busiest facility of its kind and each year serves almost ten million passengers, who are transported to over 100 different destinations. The complex itself comprises two separate terminals, known as the 'Airside' and the 'Landside', which are home to various different concourses, gateways and lounge areas. Hotel shuttles and airport buses are available to whisk passengers to downtown Pittsburgh every hour. If you arrive here with time on your hands, there is a large shopping mall on hand, with plenty of different stores and restaurants. Also close to Pittsburgh and a handful of smaller airports, which are mainly used for private flights and corporate jets. These include Rock Airport is the neighboring borough of Tarentum, and also the Pittsburgh-Monroeville Airport, which lies next to the east of the Monroeville suburb. Despite downtown Pittsburgh being divided by wide rivers, there are no less than 40 central bridges, meaning that it is easy to travel between the North Side and those neighborhoods to the south of the River Monongahela. The southern side of the downtown district can be accessed via either the Fort Pitt Tunnel and also the Fort Pitt Bridge. Renting a car has long been one of the most popular methods of transportation for tourists visiting Pittsburgh, suiting those wishing to explore Pennsylvania a little more fully. Pittsburgh is served by three international routes (I-70, I-76 and I-79). Of particular note, Interstate I-70 leads westwards to Columbus (OH) and head eastwards towards Maryland, while the Interstate I-79 heads northwards to Erie and links West Virginia to the south. The Interstate I-376 connects the city with the easterly Pennsylvania Turnpike (I-76) and is often referred to as the 'Parkway East'. 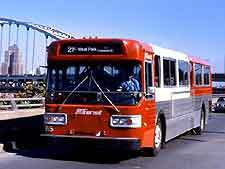 Long-distance buses in Pittsburgh are cheap and convenient, and run by both Fullington Trailways and Greyhound. 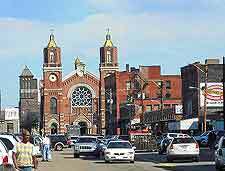 The bus station is located on the corner of 11 Street and Liberty Avenue, and offers daily transport to cities such as DuBois (Pennsylvania), Wilkes-Barre (Pennsylvania) and also Buffalo (New York). Bus travel around Pittsburgh itself is operated by the Port Authority and links the biggest attractions, neighborhoods and the universities, with the main routes features buses almost 24-hours a day (04:00 to 02:00). 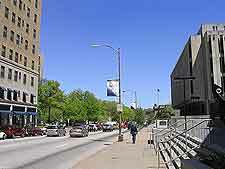 The bus routes serve downtown areas such as Brackenridge, East Allegheny, Hampton, Lower Burrell, McKees Rocks, North Side, Observatory Hill, Overbrook, Sheraden, South Side, Springdale, Station Square, the Strip and West End. The Port Authority Transit organization runs a highly convenient light rail and underground subway transport network (known as the 'T'), which serves central Pittsburgh and loops for just over 25 miles / 40 km and under the Monongahela River. Travel by metro trains is free within the inner downtown area and the main stops include the Gateway Center Plaza, Grant Street and also Wood Street. Further afield and for just a small charge, you can travel to the South Side's Station Square, and also around the southerly suburbs, where the subway travels above ground, using a total of three separate light-rail lines. Those looking to head outside of Pittsburgh and travel to other cities and towns, within Pennsylvania and beyond, will find the Amtrak train station on Grant Street. Taxi transport in Pittsburgh is a very good way to get around the tangle of roads in the city, although taxis are always a fairly expensive way to travel. Highly suited to short distances within the downtown district, taxis are notoriously difficult to find and are best booked by phone, in advance if possible, otherwise you should expect quite a wait. People's Cab and Yellow Cab tend to be the most reliable taxis firms currently operating in the city.